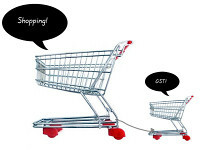 Recently, the Malay Mail Online published on their website about a just-released public opinion survey carried out this month by independent pollster Merdeka Center, 55 per cent of the 1,005 respondents said that they did not understand how the GST worked. Out of the total, 20 per cent of Malaysians said they know nothing about the GST, while 35 per cent said they do not know very much. There are many GST workshops or sessions conducted by accounting firms that are highlighting this issue. However, this online seminar is specially cater for people who are time pressed or geographically isolated to attend physical seminars. Yesterday, we look at conventional fixed deposit rate for July 2010. However, if you prefer to deposit in Islamic Fixed Deposit Account or commonly known as General Investment Account (GIA-i) instead of conventional fixed deposit account, the rates are shown in the table below. Kindly note that, the rate showed in the table below are only indicative. It means that, the rates may changes according to agreed profit sharing ratio.